Even if you don’t have a sister who would tie you a rakhi, you can tie a rakhi to your brother’s wife (sister-in-law). These beautiful Bhaiya Bhabhi Rakhis come in a set of two. A sister ties Bhaiya Bhabhi Rakhi to both her brother and brother's wife (sister in law). 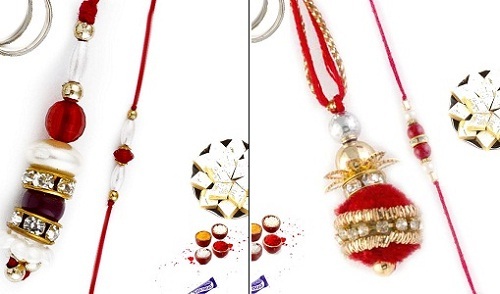 If you have a loving and caring brother who is married, go for these Bhaiya Bhabhi rakhi sets. 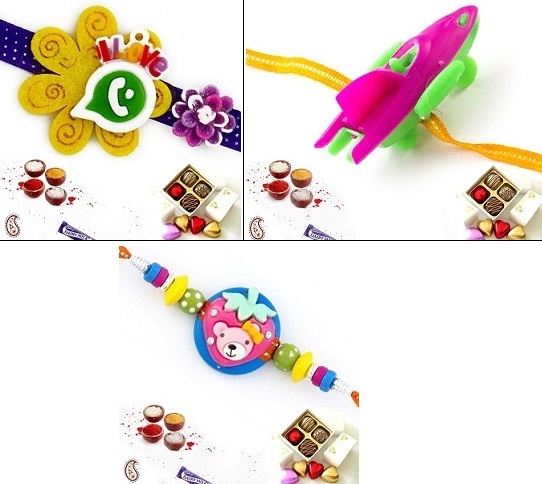 You can now buy Rakhi online and it will be delivered on or before Raksha Bandhan. Simply visit rakhi.rediff.com to browse through a wide range of Bhaiya Bhabhi Rakhis online. Instead of a plain and simple Rakhi, you can opt for one of these rakhis with dryfruit hampers. These hampers include a pooja thalis which contain everything you need to perform the rituals of Raksha Bandhan. Besides the thali, there is a packet of dryfruits along with rakhis which complete the celebration. Rakhi is mostly considered as a festival to celebrate the bonding between a brother and sister. If you don’t have a brother, you can buy rakhis for the little kids in your family. As a part of the rituals, women can tie Rakhi to the kids in the family. The kid could be their brother or sister’s son or any other kid who is close to them. It really annoys the sister when the brother gets rid of the Rakhi thread within minutes of tying it. You can now buy a designer Rakhi which would look compliment your brother’s wrist. If the Rakhi serves the purpose of a designer accessory, we are sure your brother would not want to remove it. A thread Rakhi is a really simple Rakhi without any kind of fancy hangings or embellishments. These thread Rakhis are an ideal choice if your brother is fond of tying a rakhi for a longer time or usually prefers simpler stuff. You can also tie these thread Rakhis to the priced possessions in your house like your wardrobe, locker, and telephone which are some symbols of Laxmi. 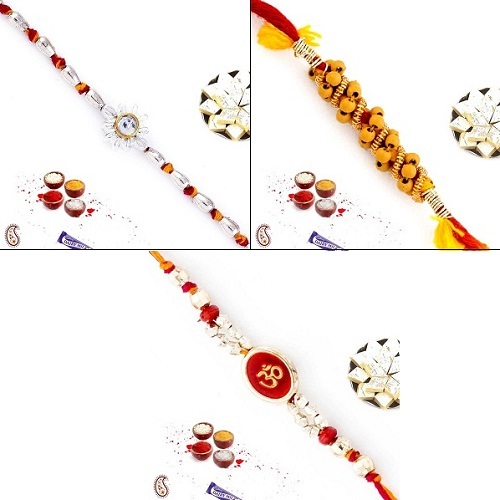 If you want to go for something unique and exclusive, you can consider buying these gold/silver plated Rakhis for your brother. Give your Rakhi celebrations a touch of class by tying a gold or silver Rakhi on your brother’s wrist. These Rakhis simply look like a bracelet. Who knows your brother might just wear it on a daily basis? Your brother may be staying in the United States for work or studies. 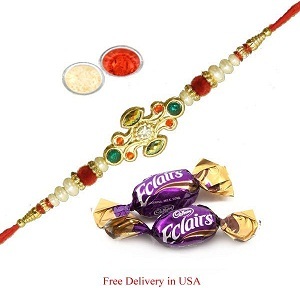 This Raksha Bandhan, send Rakhi to the USA along with lovely handpicked gifts for your brother living in the US and express your love towards them. If your brother lives out of India, you can pick any of the above Rakhi or visit our dedicated Rakhi gifts store to choose from a wide range of Rakhis for your brother/s living anywhere in the world. Simply select a Rakhi and we will make sure that it is delivered to your brother’s doorstep on or before Raksha Bandhan.